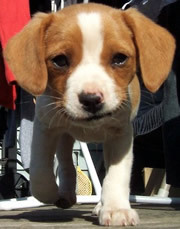 The Beaglier is a crossbreed between the Beagle and the Cavalier King Charles Spaniel (CKC Spaniel). They are frequently referred to as ‘designer dogs’ and many publications/websites often misspell the breed as Beagalier. These small dogs are predominantly popular in Australia. Beagliers commonly come in the following color combination’s: Lemon and white, red and white, orange and white, black and tan; may be bi or tri-colored. They are not AKC Recognized, but have known to be best grouped in with the hounds. The Beaglier can range in sizes from small to medium (as many other small dog groups). Most commonly, the Beaglier will resemble the Cavalier King Charles Spaniel’s size and it will inherit the Beagles sense of the scent (i.e. its a scent hound). The Beaglier has large and expressive eyes which they have inherited from the Beagle but typically has the shorter muzzle of the Cavalier. The Beaglier has innate hunting abilities and are known for their lively charisma. Like the Beagle, they are very cute and adorable. They tend to be very loving and affectionate with their families and especially with children. Beagliers have a short to medium length coat. Their hair is hard and very close which also may be slightly silky and wavy. The Beaglier is playful, gentle, good natured and very curious with where they are. They are very affectionate, calm and loving. They do especially well with their families and are gentle with children. As with many other dog breeds, they are energetic and they get very anxious if they are left unattended or alone for a long period of time. Beagliers get along best caring children who are a bit older. They can live well with other dogs but because of their hunting characteristics, Beagliers are not suited for homes with non-canine pets. They make good watchdogs and they will bark or notify their family as soon as they hear or sense something that doesn’t seem right. The Beaglier has an even temper and does best with families who have older children that can be gentle to these good natured dogs. Keep that in mind when consulting a Beaglier breeder. As a small breed, the Beaglier can do well in an apartment provided they are given a lot of exercise and are properly trained. This breed is very energetic and will do best if given enough space to run and play in. They enjoy daily walks with the leash and love to be apart of activities with family which will keep them active and happy. Beagliers have a hunting instinct so they should not be left alone in any areas where they can escape as their hunting nature will take over. It is recommended that you brush the Beaglier to remove any loose or dead hair. Only bath the dog or puppy necessary to avoid drying out the skin. Its ears can be prone to infections if not checked and kept clean regularly. As with most other small dogs, the Beaglier can be prone to health problems such as ear infections, heart disease, epilepsy and patella luxation. Beagliers have a tendency to be stubborn which can create some challenges when training. Early socialization is imporatant and you may want to consider beaglier obedience training. Beagliers will do best when training is done with firmness, patience and consistency.